I’m once again joined by AJ Porifirio of Van Ryder Games. AJ has a couple of games coming up. And we talk about If I’m Going Down, VRG’s first game. Let’s talk about Tessen and Cardboard Edison for a minute. How did you find out about Tessen? AJ: I went to UnPub 3 in January to test a game and check out games from other designers. I had a mission to sign a game from UnPub and it wasn’t until the very end of the event when I found Tessen. Tom: Give us a brief rundown? 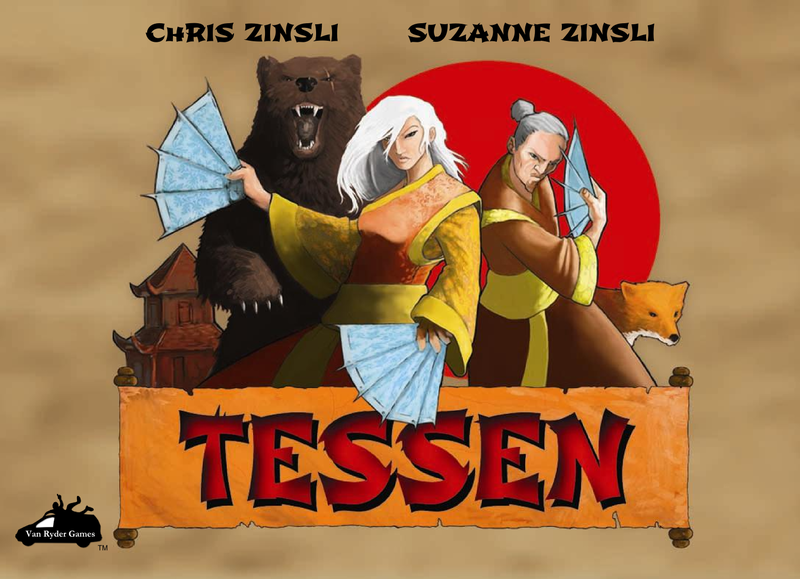 AJ: Tessen is a real-time 2 player card game where each player is drawing and playing animals in front of them as fast as they can. Once they have 3 or more of the same animal in a pile, they can save those animals to their score pile. But here is where it gets interesting… each player has warriors they can use to “attack” his opponents warriors and take the animals if the opponent is unable to defend with a warrior of their own. Tom: What about it made you want to bring it into the Van Ryder Games family? AJ: It was just a great game, but most importantly the designers were great people. Chris and Suzanne Zinsli have such a great attitude. They are confident, humble, and very open to feedback and criticism. Tom: What’s unique about it? AJ: I think the way it mixes the key elements is what makes it unique. None of the elements on their own is necessarily new, but how they have been combined makes it the best real-time card game there is in my opinion. It is a great blend of set collection, hand management, real-time play, and an interesting theme. Tom: Chris and Suzanne were recently guests on Go Forth. How has it been working with them? How’s the Kickstarter going? AJ: Chris and Suzanne are amazing to work with. We’ve had frequent conference calls to discuss the project and they have done whatever I’ve asked. But it is mostly just us collaborating to make Tessen what it is today. I am very proud of them for the game they have created and how they have represented Van Ryder Games. Tom: All right, let’s talk about Hostage Negotiator. First, tell us about it. 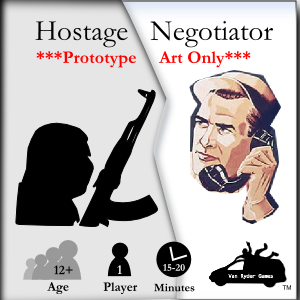 AJ: Hostage Negotiator is a solo game that pits you against an abductor who has taken hostages for some reason. It is your job to save the hostages and eliminate or capture the abductor. The game uses a sort of deck building mechanic with a twist… there is no deck, the cards go straight into your hand. Tom: I’ve played an early version and REALLY like it. It’s a lot of fun and difficult. Tom: This is your second solo game, counting IIGD’s solo mode. Why the focus on solo games? Why this theme? AJ: I got back into gaming because of solo play. A lot of my game design ideas work best with solo play. It is just something I enjoy, the freedom to get a game out and play it at any time with no dependency on others. The Hostage Negotiator theme was just one that I thought of and I couldn’t think of any games using that theme. When you think about it, it is an amazing theme and particularly suited for solo play. Tom: Give us a IIGD update. 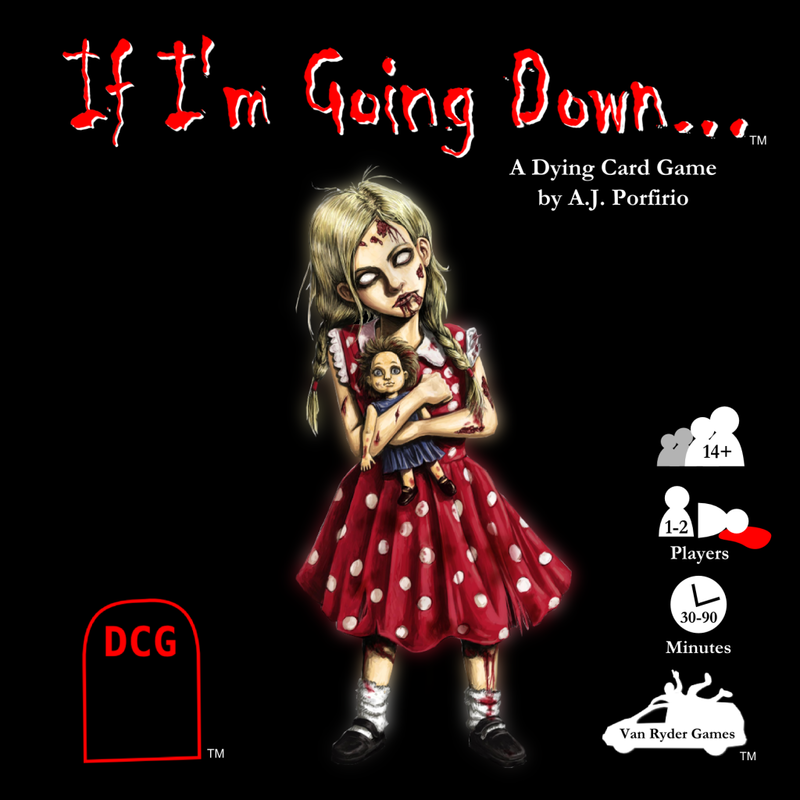 AJ: IIGD is doing pretty well. I’m going to make some decisions soon on whether the demand justifies a reprint and/or expansion but I’ve nothing to give you on that front at this point. I will say there is a very special Promo character for IIGD that backers of Tessen can get as part of the Kickstarter campaign. Tom: You’re pretty active in the game design community. What do you see as the greatest benefit of being a part of it? AJ: The connections made and the mutual support we all give one another. It is quite incredible what people are willing to do with no expectation of anything in return. Tom: What would you like to see happen in the design community? AJ: I’d like to see it continue to grow. Tom: Next projects – what’s in the hopper for VRG? AJ: Nothing I can talk about yet, but there have been several exciting developments. Tom: What blogs and podcasts do you follow? AJ: Oh gosh putting me on the spot here… well yours of course 🙂 I listen to a lot of podcasts but my favorites are The Secret Cabal and Building the Game. Tom: What’s one thing the general public would not know about AJ Porfirio? AJ: Despite my Italian name, I am also Cajun and LOVE crawfish. If anyone has a boil, hit me up! It was awesome talking to you AJ. I appreciate you taking time out to give us an update. I am looking forward to Tessen and Hostage Negotiator. And thank you for visiting. Come on back for more interviews and reviews.